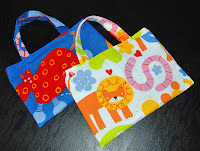 These small bags are perfect for all little things needed when out and about with little ones. For the smallest ones they fit a few nappies, wetwipes, dummies, spare clothes and a small cuddly toy. For slightly older ones they easily hold nappies and wetwipes plus a few items for yourself, e.g. purse and keys.